UPMC Altoona and its Hillman Cancer Center opened an expanded medical oncology facility in 2017 and added mesothelioma specialist and thoracic surgeon Dr. Rodney Landreneau to its staff. The addition of Landreneau, with more than 25 years of experience, has allowed UPMC Altoona to begin handling complex cases of pleural mesothelioma. It now offers a multidisciplinary treatment approach that includes aggressive surgery, chemotherapy and radiation. Those patients previously were sent to Pittsburgh, Baltimore, Cleveland or New York. 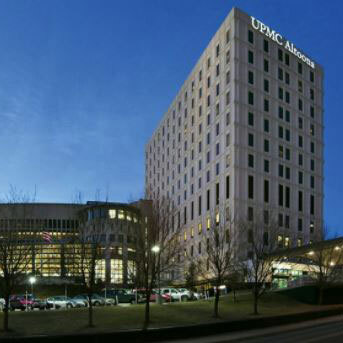 The Altoona regional facility is approximately 95 miles from the UPMC headquarters in Pittsburgh. The Altoona area was once known for having the largest industrial railroad complex in the world, a major source of asbestos-related lung diseases that have continued to plague the area. The new 16,000-square-foot facility, which is almost double in size, includes 28 medical oncology treatment bays. It is located alongside the UPMC Altoona Surgery Center. The Hillman Cancer Center, with its flagship facility in Pittsburgh, has earned a national reputation for excellence with innovative, quality care and a vast range of services. Patients are assured of receiving the latest and most effective advances in diagnostics and treatment. The latest developments in cancer prevention and detection also are being utilized throughout the network. Resources and research under the Hillman Cancer Center umbrella are spread throughout the 35 satellite centers across Pennsylvania, Ohio and West Virginia. In Altoona, it is part of a not-for-profit, regional health care system — UPMC Altoona — that serves more than 20 counties throughout Central Pennsylvania. An acute-care teaching hospital anchors the complex. With more than 3,000 employees, the UPMC Altoona Hospital complex is the largest employer in Blair County. Disclaimer: UPMC Altoona Hillman Cancer Center has no professional affiliation with Asbestos.com. UPMC Altoona (n.d.). Medical Services: Regional Services. UPMC Hillman Cancer Center. (n.d.). Altoona.